First Ascent: 1901 James Outram; C. Bohren; Christian. Hasler Sr. (App 10-48; AJ 20-545; CAJ 1-90) Other reference Outram 38. This peak is #6 on the Height List for Alberta . This peak is #2 in Prominence List for Alberta . This peak is #16 on the Height List for British Columbia . 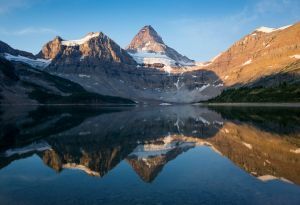 This peak is #23 in Prominence List for British Columbia .Mount Assiniboine is an impressive pyramid sometimes referred to as the Canadian Matterhorn. Either Assiniboine or Forbes is the tallest of the eighteen peaks that comprise the southern component of the group of fifty-two eleven-thousand-plus summits of the Rocky Mountains. As well, it is usually considered the queen of the southern Rockies, partly because of its height which causes it to tower above its surroundings, but also because of its aesthetically symmetrical and pyramidal shape, as well as its inspiring location. For all these reasons, it is a peak frequently visited, often ranking in the estimation of the non-local climber up with Robson and even Mount Alberta. In some lists of the 11,000 foot peaks in descending order, Assiniboine is shown as being higher than Mount Forbes. However, the latest TRIM data shows Forbes at 3617' and Assiniboine at 3616'. We have taken the height to be 3616m based on spot height on the BC Trim maps. See the attached "Mountain Notes" for an analysis. Name Notes: Named in 1885 by George M. Dawson in 1885 after the name of the Stoney or Assiniboines First Nations. James Outram described Assiniboine majestically in the following from his writing about the mountain, "Its massive pyramid forms a conspicuous landmark from almost every considerable eminence for scores of miles around, towering fully 1500 feet above its neighbours, and by its isolation no less than by its splendid outline commanding attention and admiration." The Assiniboine, also known as the Assnipwan or sometimes the Stone Sioux, are originally from the Northern Great Plains area of North America (Montana, Saskatchewan, Alberta and southwestern Manitoba around the US/Canadian border). Images of Assiniboine people were painted by such 19th century artists as Karl Bodmer and George Catlin. The Assiniboine have many similarities to the Lakota (Sioux) people in lifestyle, linguistics, and cultural habits, and are considered to be a band of the "Nakoda" or middle division of the Lakota. Mount Assiniboine adopted in 1917.